I have never tried any products from Sigma Beauty but I always hear American YouTubers and Beauty Bloggers talking about this brand. You can purchase Sigma products from HQ Hair if you’re in the UK and they have a small selection of both makeup & brushes. I have been testing out two products from them so I thought i’d let you know how I got on. First up the packaging of both makeup products is lovely and simple, I really like this minimal but bold style. Hold on to your hats this is one heck of a bold pink – its POW in your face bold. Its pigmented and the colour is intense after just one application. Its a true magenta pink and its such a pretty shade. The formula is creamy and feels lovely on the lips. I thought with it having quite a buttery texture that it wouldn’t have great staying power but I was wrong, this stays put for hours and although the colour does wear down a little its still a lovely bright pink. The packaging is a gorgeous bold vibrant pink and the lipstick feels luxurious & quite weighty. It has a magnetic close which is very satisfying and means its not going to come undone in your handbag. It has Sigma embossed on the actual lipstick and a pretty holographic Sigma Pink logo on the outer pink packaging. It feels lovely in your hand and I think its up there in terms of quality. 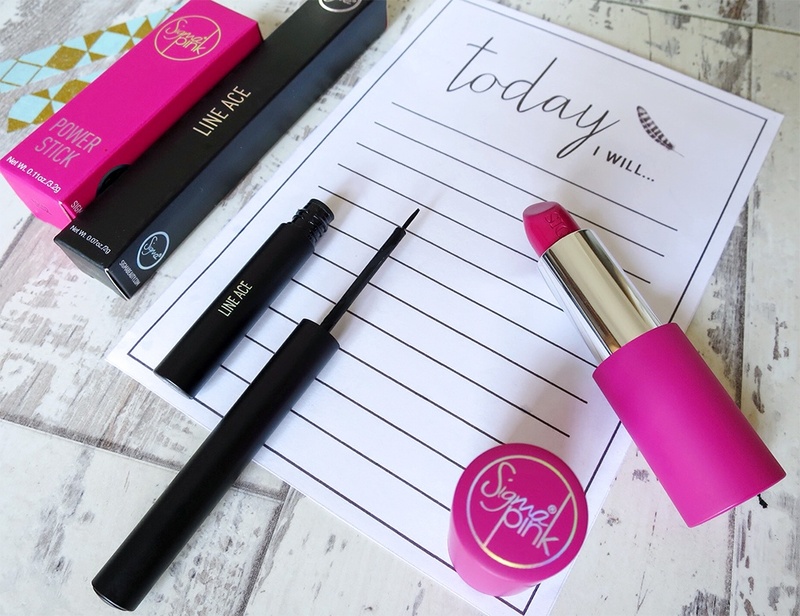 If you like that full coverage bold lip look then this Sigma Pink Power Stick is one you need to try. I’m smitten and I now want to try a few more shades & there are 6 shades to pick from. I do love an intense black liquid liner & love trying out new brands, they always have a lot to live up to if they are to beat my beloved Charlotte Tilbury. This Sigma eyeliner offering is in the shade Legend and its so jet black, as intensely black as it gets. It does have a glossy finish which I personally do not mind. It dried down quite quickly and stayed put throughout the day, no transferring or smudging. It has a very precise brush applicator, which was quite easy to use and I was able to get a very neat finish but I just prefer a nib rather than a brush. I find that is easier to achieve more of a bold liner look and I can control it better. I am going to practise a little more & see if it can win me over, because the colour is the blackest liner I have used. This Line Ace comes in some beautifully vibrant shades & I think the purple looks amazing. Have you tried anything from Sigma Beauty or do you like the look of the two products I have been testing out?